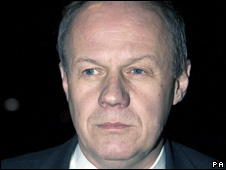 Civil servants exaggerated the seriousness of Home Office leaks which led to the arrest of Tory MP Damian Green, a committee of MPs has said. The Crown Prosecution Service is to say later if it will prosecute Mr Green and the official who fed him information. The inquiry ran into controversy when the Tory immigration spokesman was arrested and had his office searched. The home affairs committee questions whether police would have got involved if they had not been misled. It has also called for changes in the way sensitive cases such as this are handled. Mr Green and Christopher Galley, a junior civil servant working at the Home Office, both deny wrongdoing. Mr Green says he was releasing information in the public interest. The home affairs committee looked into the leaks inquiry amid criticism and concern from fellow MPs about the way police arrested and searched the Tory MP's office without a warrant last November. In its report, the committee said that in future the bar should be set higher for when police are called in to investigate leaks. It heard that there had been more than 20 leaks in 2007 and 2008 which were "damaging trust within" the Home Office and said that civil servants in this case followed the correct procedure for investigating them. But the committee raised concerns about a senior Cabinet Office official's letter asking police to investigate, which stated: "We are in no doubt that there has been considerable damage to national security already as a result of some of these leaks." The MPs said there was a "clear mismatch" between the contents of the letter and the description of the leaks provided by the Home Office's top civil servant, Sir David Normington. Sir David told the committee "at least one" of the leaks had raised issues of national security but most had not and that one was "not the significant factor" in seeking police help. The committee said: "We are concerned that growing frustration in both the Home Office and the Cabinet Office may have led officials to give an exaggerated impression of the damage done by the leaks that could reasonably be presumed to have emanated from the Home Office." While the police might still have decided to investigate anyway, the committee said it believed "it was unhelpful to give the police the impression that the Home Office leaker had already caused considerable damage to national security". Labour MP Keith Vaz, chairman of the committee, told BBC Radio 4's Today programme he understood the civil servants' frustration, but such an exaggeration was still unacceptable. He added: "Police were called in because the word national security was used, as a result of which we had a chain of events which led to this case. "The fact is you should only use the word national security if there is a clear breach of the criminal law." This is the only parliamentary probe so far into the events last November, when Mr Green was arrested and held by police for nine hours. The committee decided to set up its own inquiry into the way the Home Office reacted to suspected leaks and the police procedures. Liberal Democrat home affairs spokesman Chris Huhne said officials "seemed to have complained about national security when all they wanted to hide was their embarrassment". "The police should never have been involved in this case, which should have been handled as an internal civil service disciplinary matter," he said. The committee also said police had adopted a "cautious approach" due to the political sensitivity of the inquiry and had alerted several people about the search operation including Tory leader David Cameron and London mayor Boris Johnson. In future, politicians should only be informed in "exceptional circumstances" while an operation was under way. The committee said the "heavy involvement of so many high-ranking officers" had caused it some concern. But while it was "regrettable" there had been a misunderstanding about the issue of searching a Commons office without a warrant - police had followed "procedure set down in statute" by seeking consent before applying for one, the committee said. A Home Office spokesman said: "We note this report, which recognises our intention to conduct a review on a range of issues arising from this investigation when it concludes, and will respond in due course. "As this police investigation remains ongoing it would be inappropriate to comment further."